n a s t u r t i u m . . . 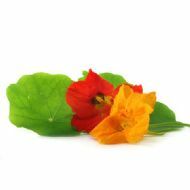 Nasturtium are tender annuals and very easy to grow from seed. As well as looking incredibly colourful, the leaves, flowers and seeds are all edible, adding a peppery flavour, not dissimilar to watercress, to salads and savoury dishes. Sow: your nasturtium seeds under cover from March to May. When all risk of frost has passed, transplant to a sunny site, perhaps allowing them to cover a wall or trellis, or trail from a hanging basket. Seeds may also be direct sown in May.